A uranium-zirconium district in Guyana. U3O8 Corp. has identified 10 uranium-zirconium – bearing zones with a further 2 having been drilled by a prior explorer of the property. 4 of the zones drilled by U3O8 Corp. contain a 16 million pound uranium resource, and the other 8 zones are ready for resource estimation. 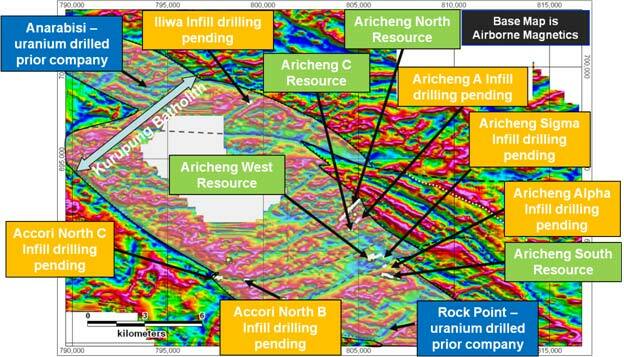 3 uranium-bearing shoots in the Aricheng North vein were used in the resource estimate, but since then, another 2 shoots have been identified by scout drilling, but have not yet been more intensively drilled for resource estimation purposes. A further example of additional potential on the veins on which resources have been estimated is the Aricheng South vein: the widest, richest intercept was from the deepest bore hole drilled, that intersected the uranium-bearing zone at only 220 metres below surface. Figure 2 shows the Aricheng South vein’s uranium concentration (warm colours are areas of highest concentration and cool colours have the lowest) using the same colour scheme and scale as the Paladin Energy’s 107 million pound Michelin Deposit in Labrador. 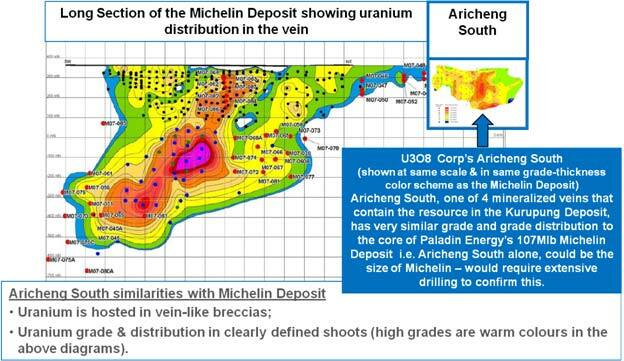 Aricheng South appears like a postage stamp on the top right of the diagram, and has very similar uranium distribution to the upper parts of the Michelin Deposit. This amazing similarity between the deposits begs the question: would deeper drilling on the Aricheng South vein show that it has similar depth extent and therefore resource potential as the Michelin Deposit? U3O8 Corp.’s management certainly believes so. U3O8 Corp.’s exploration has shown that uranium in the Kurupung Project is located in demagnetized parts of the Kurupung Batholith – a granitic rock. Detailed study of drill core has led to the conclusion that uranium-bearing fluids ascended into the granitic rocks along faults and fractures, and converted the magnetic iron-mineral, magnetite in the granite, to a non-magnetic iron mineral called hematite. This demagnetization of the granite provides an excellent exploration tool for identifying fractures that uranium-bearing fluids ascended along because magnetism is easily measured by aircraft or on the ground. Figure 1 is a map of the magnetism measured over the Kurupung Project area and the extent of the Kurupung Batholith is shown in a pale gray overlay. Warm colours are magnetic areas that are not prospective, while cool colours (blues) are areas of low magnetism. All of the uranium-bearing zones that U3O8 Corp. has so far drilled, lie in blue corridors, and measurements of the magnetism of the drill core confirms that the uranium lies within the demagnetized parts of each bore hole. U3O8 Corp.’s conclusion is that the blue corridors on the map of the magnetism of the Kurupung Batholith represent targets for a uranium-bearing vein. Since there are numerous blue (demagnetized) corridors within the Kurupung granite, there is enormous potential for the Kurupung Deposit to grow in size.